Welcome to Rome, the Eternal City! At Rome International Airport, your private driver will be waiting to take you to your five-star hotel. Enjoy the afternoon and evening at your own pace, exploring the narrow streets and beautiful piazzas or sampling the local cuisine in one of Rome's fine restaurants. Ask your leisure travel consultant for recommendations of their favorite restaurants, cafes, and entertainment. After breakfast, your licensed English-speaking guide, will meet you at your hotel lobby. Your private tour will take you on a journey through the city, in which the power and the glory of the Great Roman Empire developed and extended. Your guide will walk you through the enchanting ruins of the Imperial-era, beginning with the Piazza Venezia and its impressive monument, dedicated to King Victor Emanuel II and the Unknown Soldier. You will continue to the famous Piazza del Campidoglio, designed by Michelangelo, with a breathtaking view of the Roman Forum. With the remains of the Forum as a backdrop, your guide will present the history and anecdotes on the social and political life of Rome, from its origin, to the glorious days of the Great Roman Empire. Continue your tour to the magnificent Coliseum, an iconic symbol of Imperial Rome, and one of the most impressive buildings of the Imperial-era. Spend the day sipping an espresso at one of the numerous cafes and exploring more of the deep history, culture and art of Rome on your own. Take an optional private tour of the Vatican Museum and Saint Peter's Basilica, where you will see the famous Sistine Chapel, with its ceiling depiction of Michelangelo Buonarroti's The Last Judgment, and wall frescoes, with artists, such as Botticelli, Perugino, Rosselli, Ghirlandaio and Signorelli, all depicting the lives of Jesus and Moses. Continue to St. Peter's Basilica, where Peter, the apostle considered as the first pope, was crucified and buried. The interior of St. Peter's Basilica is impressive, with a display of the finest Renaissance monuments, by great artists such as Michelangelo and Bernini, fill every empty space. If open, you will have the opportunity to visit the Vatican Grottoes. After breakfast, your private driver will pick you up from your hotel and take you to Tuscany, one of Italy's most famous regions, known for its gorgeous landscapes, rich artistic legacy, influence on high culture, and unique culinary tradition. Broaden your horizons on a full day of adventure in the beautiful countryside of Chianti, accompanied by your guide, making stops in the lovely hilltop towns of Greve and Castellina. Explore your senses with wine tastings at local vineyards and at villages known for their traditional cuisine, such as schiacciata con olio, better known as a focaccia-like bread with oil, and soft salami with fennel seeds, which Italians call finocchiona. Drive through the forests where, in October, the famous porcini mushrooms are grown. The area is also known for its all year around preserves, such as mushrooms, artichokes, and other vegetables, preserved in oil, a process known by Italians as sott'olio. You will have a lunch break in the town of Panzano, with time to explore at your leisure. Travel to Badia di Passignano, a medieval hamlet and abbey founded in 395 by the Archbishop of Florence. Monks of the Vallombrosan Order still live in the abbey, keeping its history and culture alive. You will return to your hotel in the evening, after a fun-filled day. Enjoy a day of leisure in your Tuscan Village or set off for further exploration into the countryside. 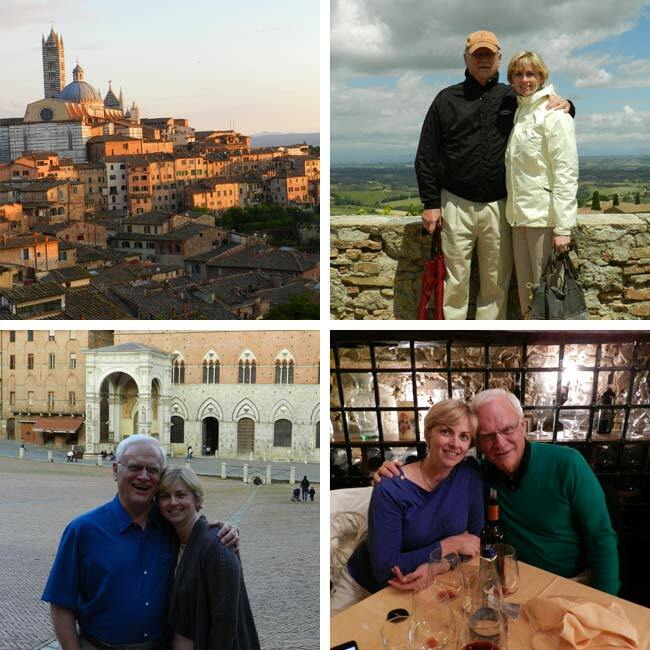 Ask your travel consultant for recommendations of their favorite activities and sites in Tuscany. After breakfast, your private driver will pick you up from your hotel and take you to Florence. After checking into your luxury hotel, enjoy the remainder of your day by exploring the striking buildings, formidable galleries, and treasure-filled churches this beautiful city has to offer, on your own pace. Your licensed English-speaking guide will meet you at your hotel lobby to begin your private walking tour through the enchanting city of Florence, also known as the Cradle of Renaissance. Bask in your stroll through the historical streets on your way to the Duomo complex, with Giotto's bell tower, a Baptistery with bronze doors, including the famous Porta del Paradiso, and the Cathedral with the magnificent Cupola del Brunelleschi. The highlight of your day will be a visit to the Uffizi Gallery or the Accademia Museum. In the evening enjoy an optional cooking class, as you learn to prepare a traditional Tuscan meal, later indulging in the fruits of your labor, while sipping local wine. 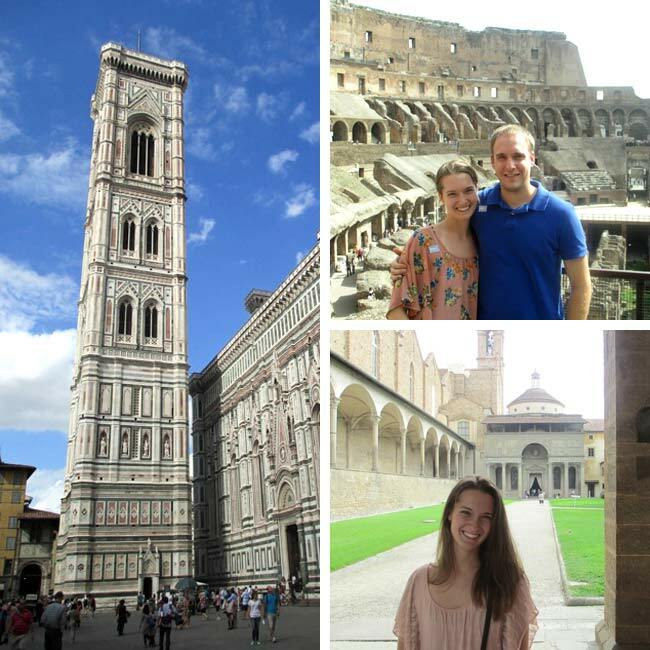 Explore Florence on your own or take a tour to the northern Tuscan towns of Pisa, Lucca, and San Miniato. Ask your leisure travel consultant for their personal recommendations of activities and excursions, in and around Florence. After breakfast, you will be transferred to the Florence Airport, to catch your departure flight. 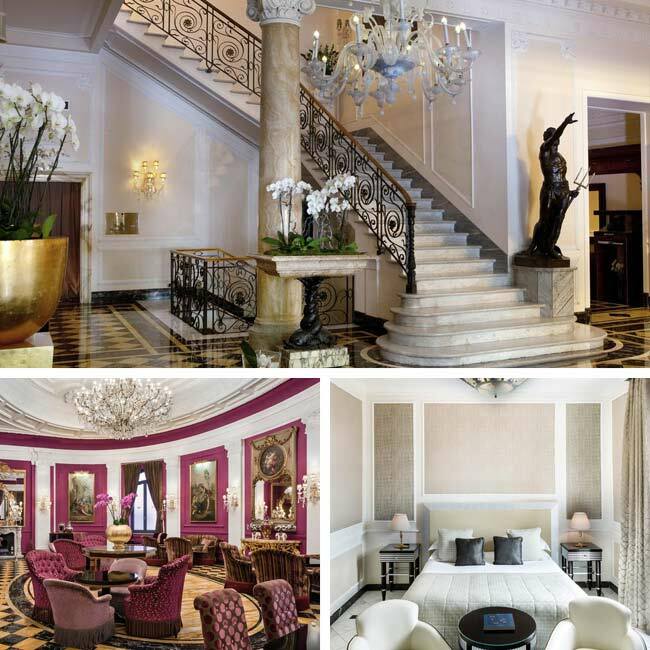 The Baglioni Hotel Regina is a luxury hotel in Rome with rooms featuring an Art Deco Style, all designed to make your stay unforgettable. 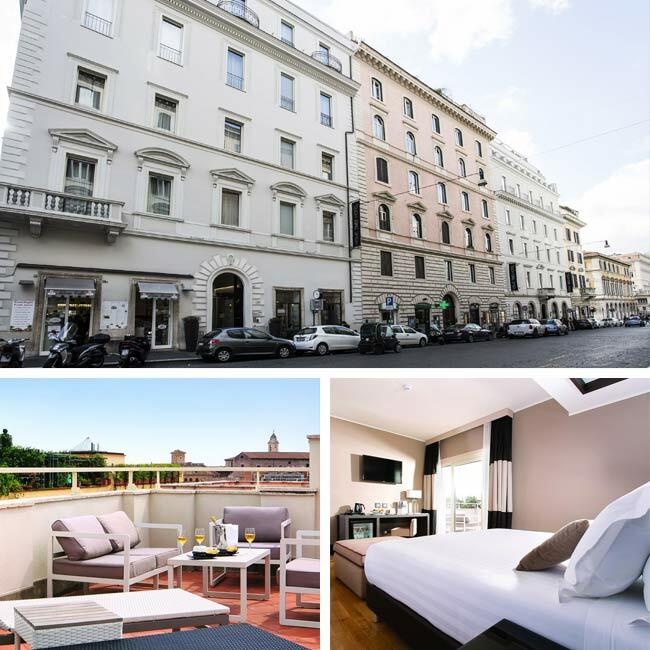 Landmarks such as the Aurelian Walls, Piazza di Spagna and Trinità dei Monti church and the Capuchin Church are in walking distance of this hotel. Rediscover the harmony between your mind and body in the Baglioni Spa, featuring a fitness center, sauna, Turkish bath, and jacuzzi. 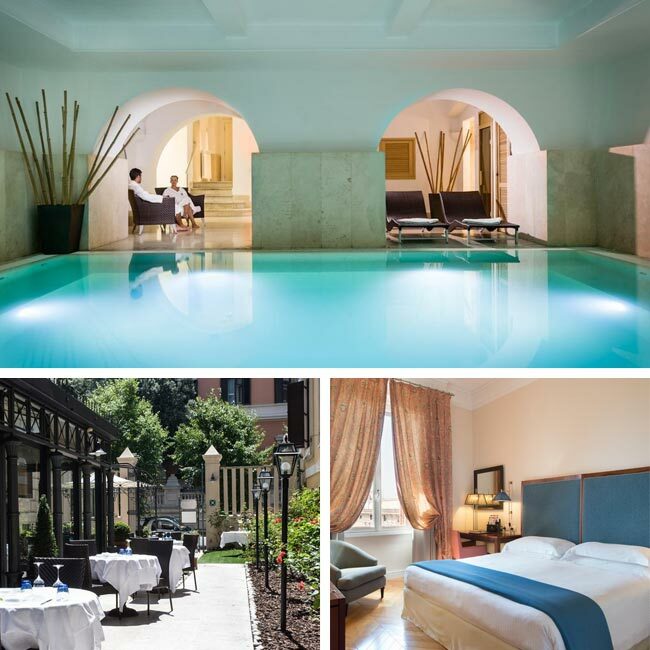 Palazzo Manfredi is an elegant hideaway in the center of what was once imperial Rome. 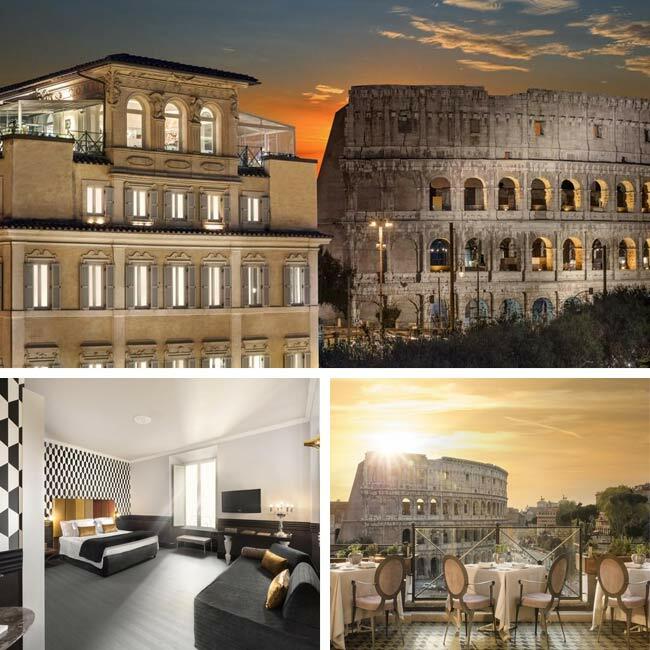 The charming 17th century palace has spectacular views of the Colosseum, the Imperial Forum, and the Domus Aurea, combined with superb hospitality. With only 14 rooms and two suites, the hotel offers an intimate experience, crowned only by a meal at the hotel's Aroma restaurant where the unparalleled vistas of ancient Rome are beautifully matched by the seductive delights of the kitchen. 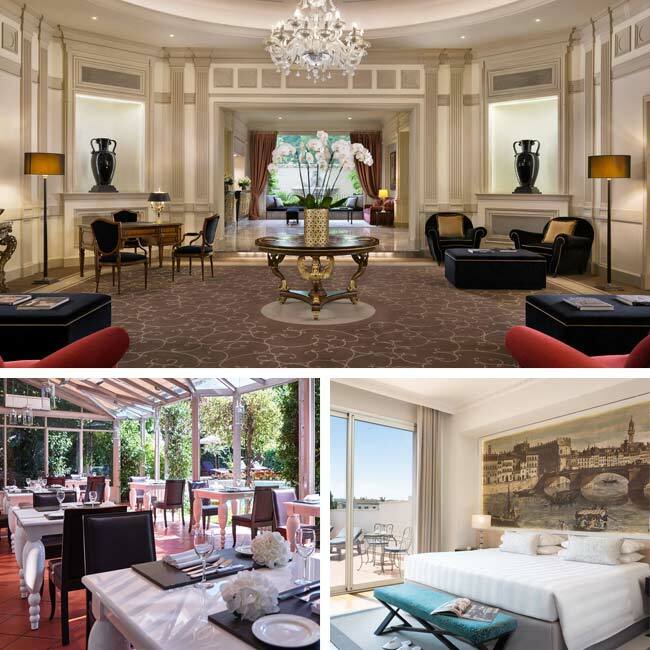 The Rose Garden Palace, a true luxury hotel in Rome featuring spacious, elegant, and beautiful rooms, with first class comforts and amenities. In the heart of the Eternal City is where style, hospitality and comfort come together giving our guests a chance to enjoy unparalleled services in elegant and peaceful surroundings. Step outside, and within walking distant you will find the best shopping, dining and sightseeing in Rome. The setting for Hotel Barocco, a leading 4-star luxury hotel in Rome, is a suitable option for travelers in search of elegant accommodation in the historical city center, with superior standards of comfort and style. Overlooking quiet streets, the refurbished Barocco Hotel is just a stone's throw away from reputable stores, chic cafes and restaurants. It is also conveniently positioned close to well-known sites and landmarks, including the monumental Spanish Steps and Trevi Fountain. Built in a palace in the late 1800's, and recently renovated, the hotel Bernini Bristol, offers glamour from a bygone era along with the most modern trimmings and amenities. 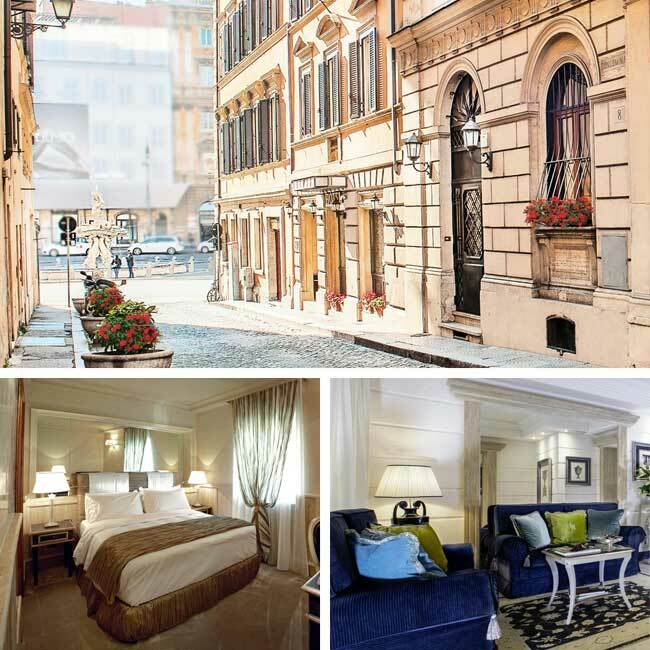 The Bernini Bristol, a five-star luxury hotel in Rome, is just minutes away from historical sites, featuring the most glamorous terrace in the city’s center. Make sure to check out the gastronomes bites at Michelin-starred chef, Andrea Fusco’s rooftop restaurant with breathtaking views. 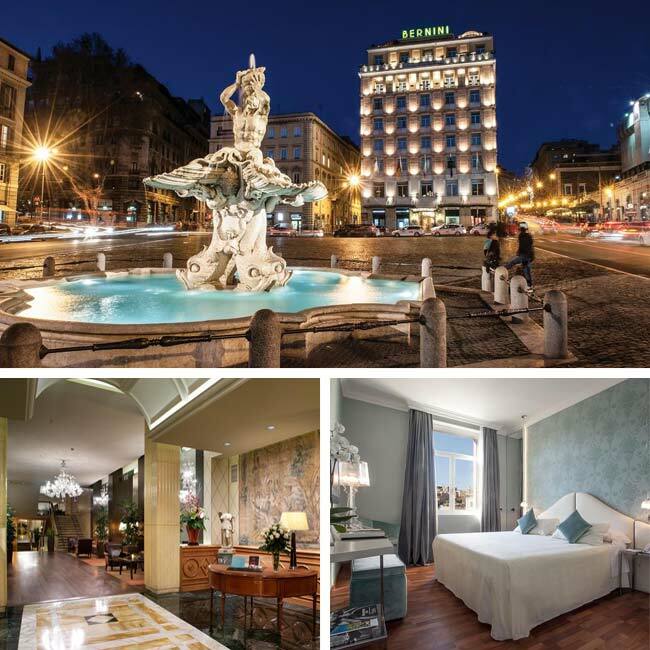 Marriot Grand Hotel Flora is a luxury hotel in Rome set at the top of Via Veneto, in a stylish Neoclassic building next to the Villa Borghese gardens, offering rooftop views of the Eternal City, and only 450 meters from the Spanish Steps. Relax in the new solarium or taste the culinary delights of the Flora Restaurant, serving Mediterranean cuisine, with only the finest and freshest ingredients used to create daily specialties. 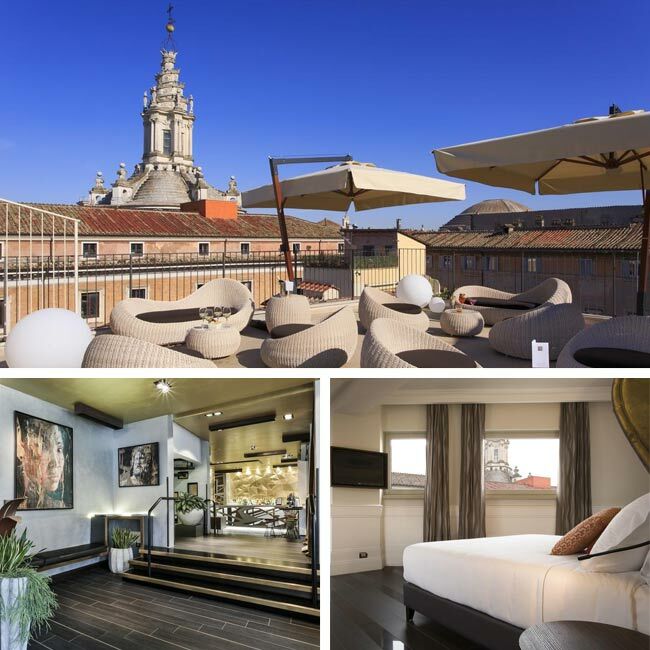 The innovative Palazzo Navona Hotel is amongst one of the most qualified 4-star Hotels within Rome’s city center, capable of offering the highest quality to satisfy even the most demanding guest. The intimate and charming ambience emits a feeling of magic surrounded by historical-art and ancient Roman treasures. 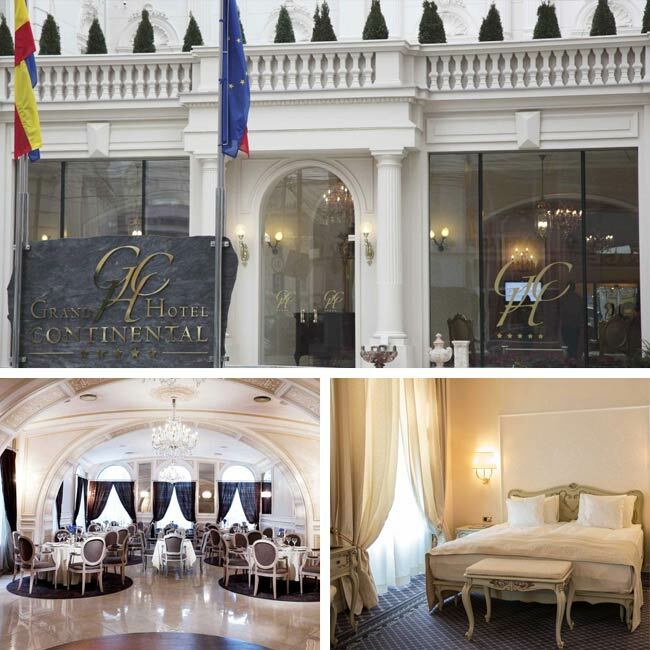 The hotel is unique for its strategically favorable location, boasting an exclusive rooftop terrace with views of historic churches, monuments and treasures. The Rome Times Hotel is in the heart of the city and less than 10 minutes away from Trevi Fountain, Piazza di Spagna and the Coliseum. This boutique luxury hotel in Rome offers its guests a contemporary design with brightness and spacious accommodations. The attention to detail, the elegant design of the furniture and the skillful lighting of spaces help to create an intimate atmosphere that pervades the entire structure. Borgo San Felice is a magical oasis on a hill among olive groves and vineyards, a true luxury hotel in Tuscany’s wine district, where guests receive the warmest of welcomes and first-class service. Relax in the Tuscan countryside in a modernized spacious suite with elegant décor or take dip in the hotel’s pool, absorbing the panoramic views. Practice your backhand at the tennis court or your putting skills on the putting green. You won’t be disappointed. 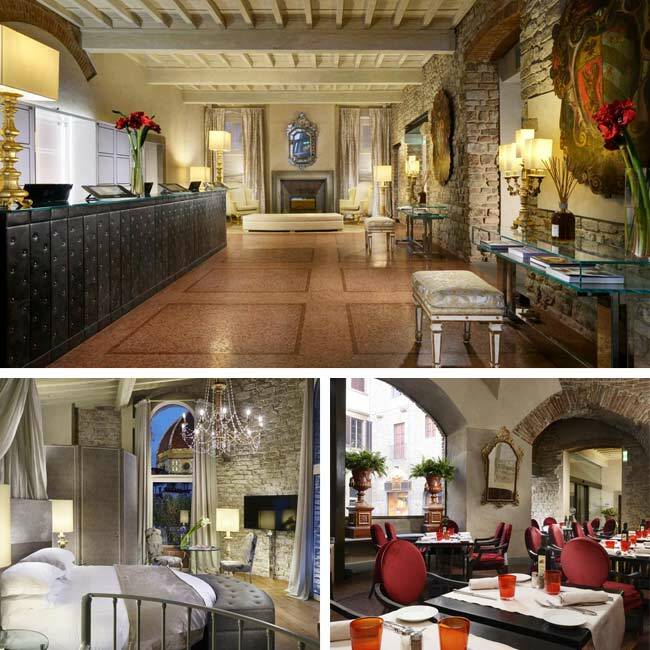 The 5-star Grand Hotel Continental is an architectural jewel of exclusive luxury in the medieval heart of Siena, just a few steps away from the Piazza del Campo. History and art are an integral part of this magnificent 17th century building. The frescoes are grandiose, the furniture priceless, the marble refined, and the atmosphere so romantic, winning the hearts of elite travelers throughout the centuries. Relax in your spacious suite or taste the different flavors in the wine cellar during your trip. 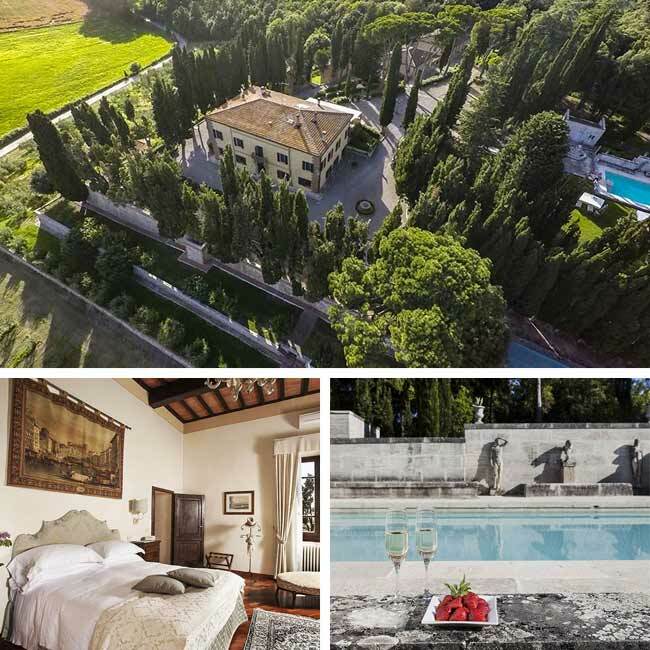 Villa Poggiano, a luxury boutique hotel in the beautiful Tuscan countryside, just a short drive from the fantastic Renaissance hilltop town of Montepulciano. This hotel is the ideal place to escape the pressures of life. The tasteful decor creates a warm, homelike ambiance. Throughout the villa, everything is on a grand scale with striking fireplaces, lavish bathrooms, gorgeous antique furniture, exceptionally spacious rooms, and ornate chandeliers. The villa faces an idyllic Tuscan countryside with olive trees dotting the gentle hillside. 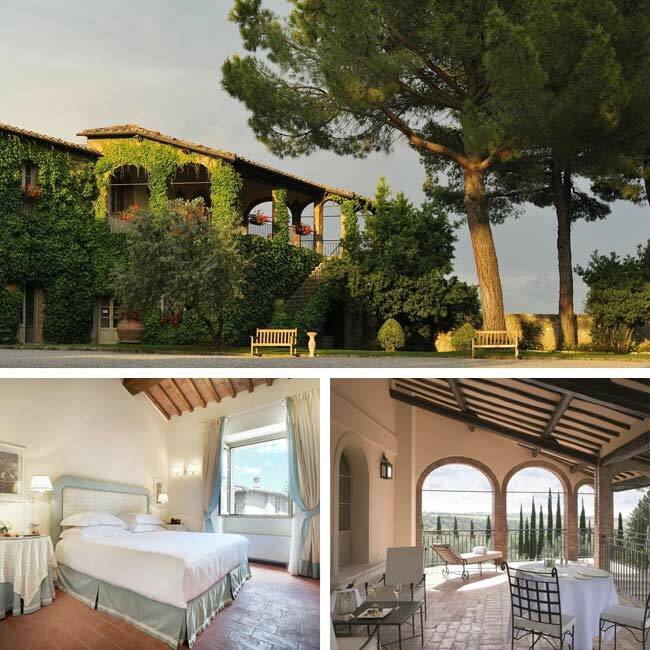 Dating back to the early Middle Ages, Villa Cicolina was once the country retreat of a noble family, renovated into a boutique hotel with fantastic views of the Tuscan countryside. Escape from the hectic daily life of the city and enjoy peacefulness in the gardens of the property, set between olive trees, with an infinity pool and jacuzzi. Take a cooking class, wine taste, or celebrate your most memorable wedding day, guaranteeing personalized service and an unforgettable stay. 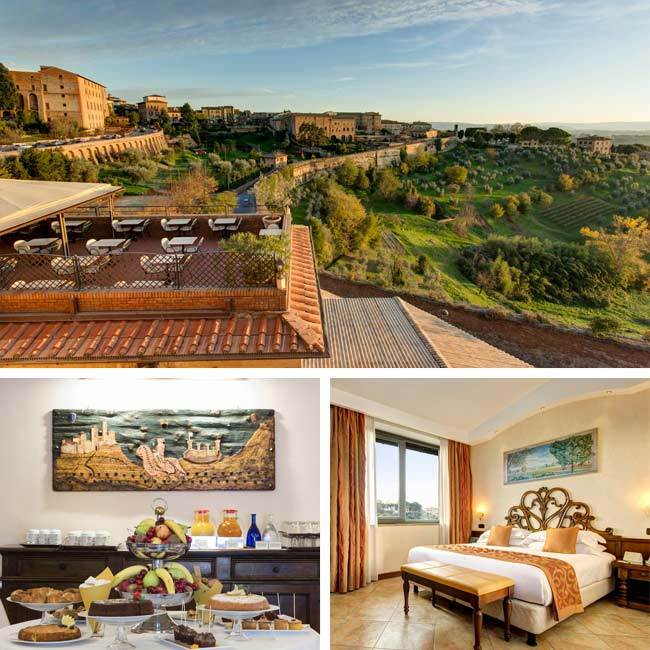 Feel at home in the heart of Sienna, at the Athena Hotel, a luxury hotel near the Piazza del Campo with terrace views, where guests enjoy the countryside and backdrop of soft green hills. With onsite parking and walk-able access to the old city, the hotel is a perfect option for all type of travelers. With attention to hospitality and courtesy, Athena Hotel pampers guests with 24-hour concierge or in the hotel’s restaurant offering simple traditional Tuscan dishes. 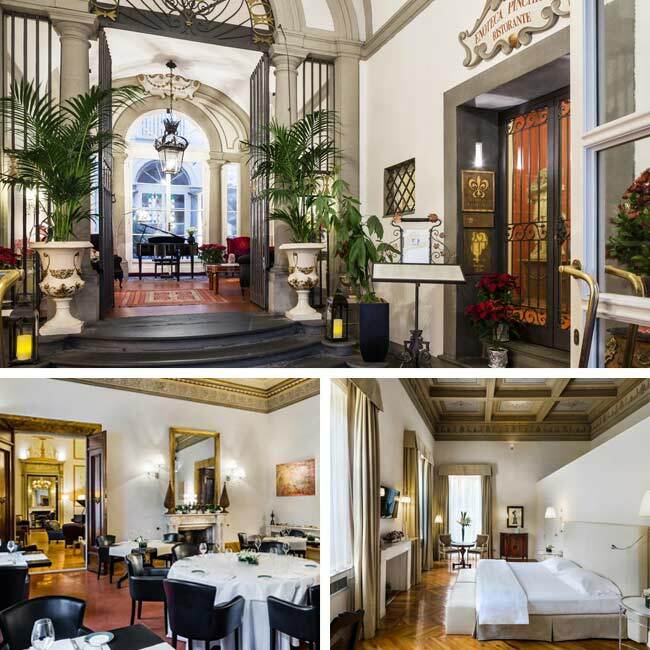 Relais Santa Croce by Baglioni Hotels is a luxury hotel in the historic downtown of Florence, set in the 18th century palazzo, chosen by guests for its ideal location, just around the corner from Piazza Duomo. Relax in the spacious rooms, some including sitting areas, spa tubs or saunas, after a long day out on the town. Be charmed by the extraordinary decorations, with lavish furnishings and frescoes ceilings, while the amazing hotel staff offers first class service. After an exclusive revamp throughout the entire premises, Grand Hotel Villa Medici, a luxury hotel in Florence, walking distance from all major art sites and shopping locations, offers a contemporary feel with modern amenities. The hotel is only 500 meters away from the train station and offers on-site parking, making it extremely accessible to all travelers wanting to easily explore the many sights of this magnificent city. Relax on your private terrace overlooking the hotel’s gardens and Florence’s monuments. 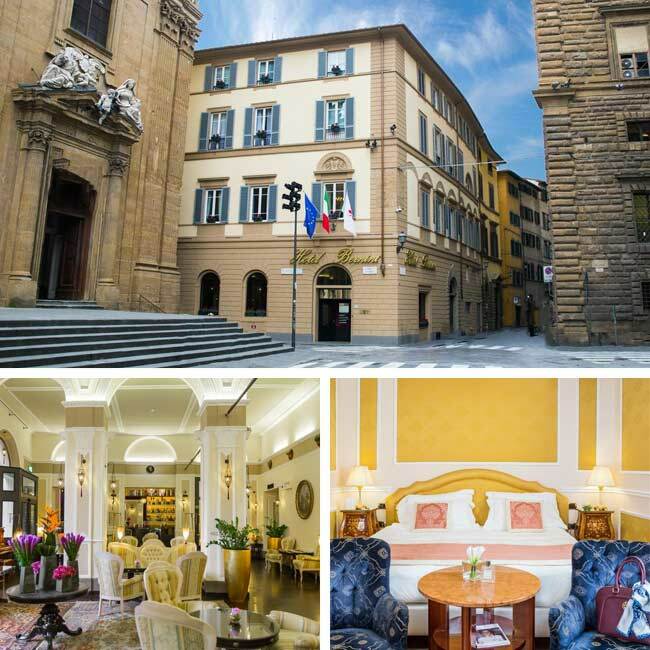 Bernini Palace Hotel, a renovated 15th Century wonderfully luxurious hotel in the center of Florence, is only a mere 5-minute walk from the Florence Cathedral and Ponte Vecchio. Indulge in the reborn traditional Tuscan beauty of this hotel through its contemporary touch of Italian and Moroccan styles combined with Florence Renaissance décor, through its combination of shapes and colors. Feel like royalty upon arrival with the welcoming first-class staff, comfortable rooms and amazing breakfast in a gorgeous historical room. Hotel Brunelleschi tells the story of its home city through various styles, combining ancient Rome to the pomp and splendor of the 19th century, with an added touch of sophisticated interiors designed to satisfy contemporary tastes. 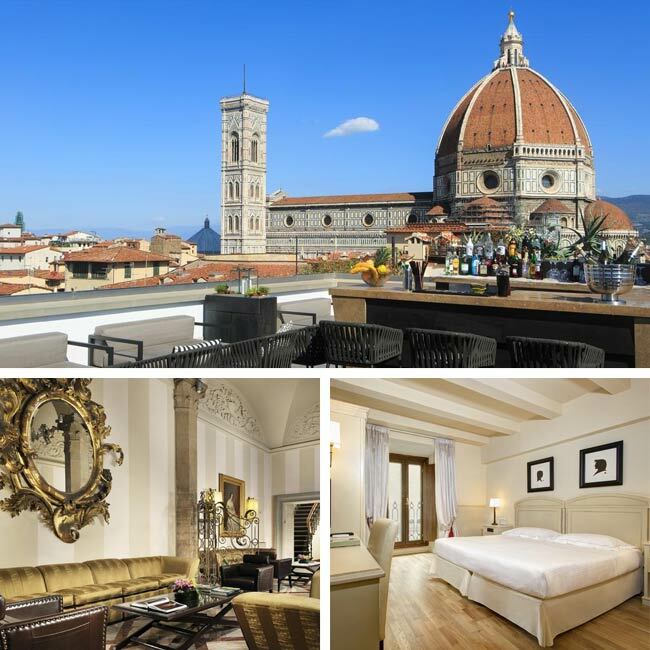 A luxury hotel, in the heart of Florence, offering 96 spacious elegant rooms with spectacular views of the city. Appreciate the unforgettable experience of relaxation with views of Via de' Calzaiuoli, the beautiful Piazzetta del Giglio and Brunelleschi's magnificent dome from the luxury of your room. 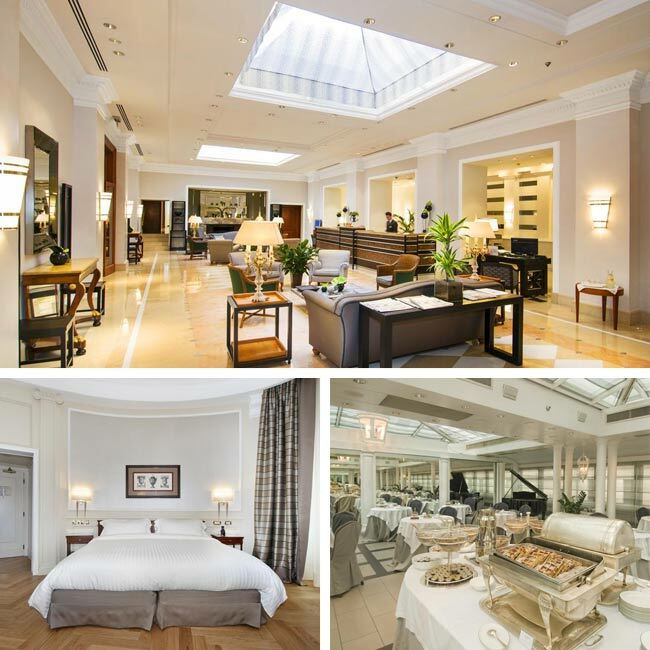 Grand Hotel Cavour is an idyllically positioned hotel in Florence, walking distance from Europe’s grandest Gothic cathedral, offering rich comforts through its contemporary guestrooms making it a perfect choice for all travelers interested in shopping, food and museums. Enjoy the luxuries in your cozy room, fill up on the amazing breakfast selections, or winddown at night with a cocktail on the rooftop terrace, with panoramic views of the city, to make your stay in Florence top notch. 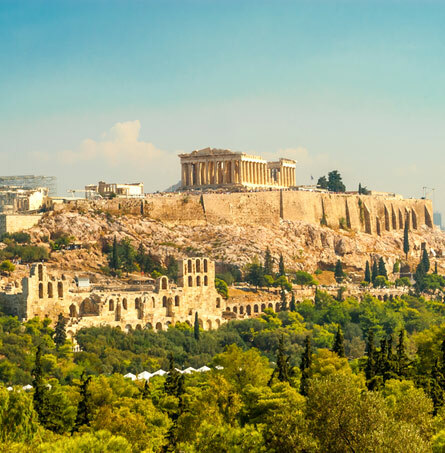 Get a taste of history, culture and cuisine when you head off to Athens, the birthplace of democracy. Spend three nights at one of our top luxury hotels, with magnificent views of the Acropolis. Enjoy a full- day tour of the historical highlights around the city, including the Acropolis, the Acropolis Museum, the ancient Agora, the neoclassical buildings of Plaka, the changing of the guards at the Parliament building, Lycabettus Hill, and more. Your three nights/four-day extension includes roundtrip airfare from Cairo to Athens, private transfers, hotel accommodations, private tours, and local assistance. What a truly marvelous trip we had. Your guidance and help were invaluable. When using a service like yours, things have to happen on two levels. First, events have to occur on time and without a hitch. And second, of course, is that the recommendations have to live up to their billing. You score an A+ on both. Our drivers, in particular Christiano and Elio; and our guides Monica, Claudia, and Stefania were superb.They didn't just educate us on the histories and the towns, but also gave us unique glimpses into current life in Tuscany. The tour of Tenuta Valdipiatta was also a highlight. I could go on but will finish by saying a big "Grazie" from Amy and me and letting you know that we will surely be recommending your services. Our trip was amazing! Thank you for all your help in planning and preparing us for the trip. All the transportation arrangements helped tremendously and perfectly arranged. We absolutely loved our stay in Florence. We had a fantastic view of the Duomo from our hotel! Such an amazing city with so much culture, history and character. It definitely helped to have our first tour the first morning of our stay in Florence. We were able to get some great advice on things to see, places to eat and of course the best gelato places! Our favorite gelato place was Perche No! - they use all natural ingredients and it was fantastic! Our favorite lunch place became Il Frattalini (a small sandwich shop, right around the corner from Perche No!). Both were extremely close to Duomo. We would highly recommend climbing the stairs in the Duomo! It was a fantastic view of Florence and such an interesting hike up the tight staircases to get to the top. We were able to see everything we wanted to in Florence in the 3 days spent there, however I could see myself staying longer in the future to explore the city more beyond the tourist attractions. 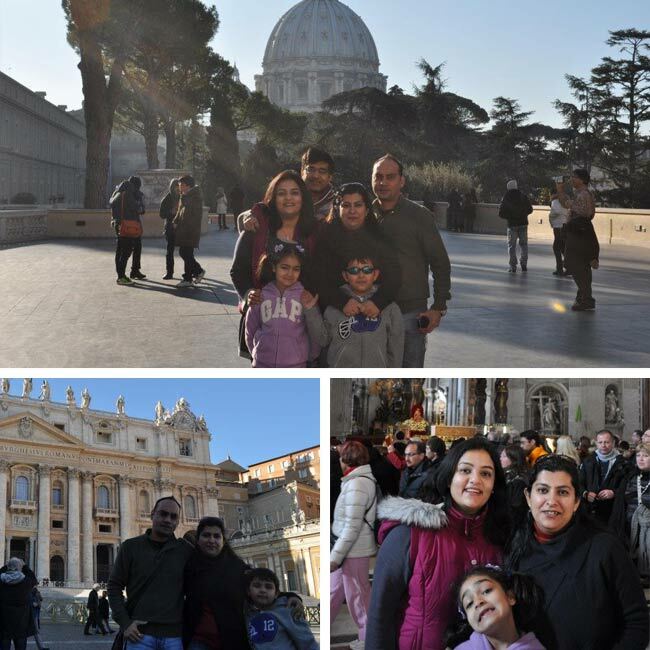 Our stay in Rome was another fantastic experience! There is so much history in that city! Our hotel was beautiful. Our tour guide, Phillipe, through the Vatican, Sistene Chapel and St. Peter's Basilica was fantastic! He was so knowledgeable, friendly and funny. Rome is definitely a bigger city, which made it a lot different than navigating through Florence. I felt we got used to the city of Florence after 3 days where in Rome after 4 days we still need to always be referring to the map. We walked all over in Rome to absorb as much culture and experience from a pedestrian's point of view rather then from inside a vehicle (very tiring, but well worth it!). Rome by night was a neat experience, definitely was fun to meet people. Our tour guide on the Rome by night was also another great guide! It was a nice end to our trip to some up everything we had seen and experienced during the day earlier in the week. I've attached a few photos from our trip for you. Thank you again for helping to give us such a fantastic and unforgettable experience. Wish you a very Happy New Year, Hope you have a great 2012. Thank you so much for a wonderful holiday..we all enjoyed our visit to Italy and it is all Thanks to you. I have to commend your team on the efficiency and coordination for every small detail. The hotels recommendd by you were perfect and so were the tours that you had planned. While we did personally thank them, please do convey our warmest of appreciation to Fillipo and Francesco for being wonderful guides and making our trips so much more fun. The kids absolutely enjoyed the tour given by Fillipo and he was very patient with them. The Talwars join me in thanking you for organising everything so well. It was a great trip and I hope we can plan more such holidays with you in the future. P.s ..We received your lil welcome note in Rome..indeed very thoughtful of you. Please complete the form below to receive your personalized vacation quotation. A Travel2Italy specialist will contact you to begin planning the vacation of your dreams!